I'll admit it, I was skeptical when I was asked to review the Hollywood Cookie Diet. I mean, it's called the cookie diet, right? How could it possibly be anything other than a scam? How could you possibly eat cookies all day and lose weight? Of course, I also immediately agreed to try it just because it's called the Hollywood Cookie Diet. I am nothing if not a glamorous, a-list celebrity wannabe with a sweet tooth. Each box contains a dozen individually-wrapped cookies that are high in protein and fiber. The idea is that you substitute one cookie for breakfast and one for lunch, then eat a sensible dinner. You may also eat a cookie in lieu of a snack. Each cookie is about 150 calories, so if you eat four cookies instead of two meals and two snacks per day, you can cut a lot of calorie intake. The Hollywood Cookie Diet website notes that if your normal calorie count is 3000 daily, by eating four cookies per day (600 calories) and a healthy dinner (800 calories) you could lose 15 lbs in one month! Those results sound pretty dramatic to me but the Hollywood Cookie Diet can certainly be used to jumpstart weight loss or maintain it, especially when combined with an exercise regimen. As a mom, I appreciated the ease of keeping a pre-packaged cookie in my bag in case I forgot to eat a meal or was tempted by a diet-crashing snack while out of the house. I was impressed with how well they curbed my appetite. I didn't think a little cookie could hold me from one meal to the next but they really are very filling. Taste-wise, they're not significantly different than other pre-packaged cookies you might buy at a convenience store (think Grandma's). 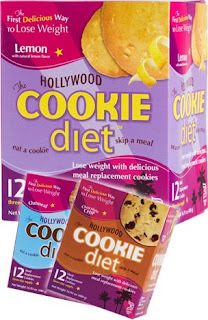 The Hollywood Cookie Diet is available in three flavors: chocolate chip, lemon and oatmeal raisin. All three are okay but I was surprised by how much I enjoyed the lemon flavor, since it's not usually one of my favorites. They're not a match for my homemade cookies, of course, but they also don't pack the caloric burden that mine do from all the butter and sugar. I also don't feel a big need to eat as many as possible in one sitting, so that's a plus! At around $20 for a box of 12, the Hollywood Cookie Diet is a bit on the pricey side but comparable to other meal replacement options. I thought it would be more convenient to buy them packaged in one week supplies, which would be 28 cookies, but I think the sticker shock might scare potential customers off. One thing that is nice is that the Hollywood Cookie Diet seems to be widely available. I saw them on the shelf at my corner drugstore. I'm not sure I would keep them on hand all the time but they are great to kick off your diet or to keep yourself in line for a big event. Full disclosure: I received two boxes to try the Hollywood Cookie Diet out at home. I love cookies but my weakness is cake. Cookies in the morning, cookies in the evening, cookies at suppertime. Thanks for eating the cookies and for such an honest review! Mmmmm...now I want a full-fat lemon cookie. This seems like a good idea, to substitute them for meals, at least if you're a sweet tooth. Me, I'm a salt freak, so if they had the Hollywood Chip Diet, I'd try that. I keep hearing ads for these cookies and I have to say, they kind of make me laugh. I told my daughter the other day...you could eat anything you want and loose weight as long as you keep your calorie count down.